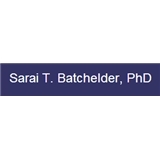 Sarai Batchelder (New York) - Book Appointment Online! If you are depressed, anxious, or stressed by a current transition or problem, therapy can be one of the most important (and scary) steps to take. I specialize in resolving long-term depression, relieving anxiety, and restoring pleasure, meaning, and peace in people's lives. Dr Batchelder made me feel comfortable and, after listening intently to everything I said, gave me insightful feedback.